So in Googling around for the origin of the decorating adage “every room needs something red in it,” I found an entire website by that name! I’m not sure it belongs only to the proprietor’s Grandmother Frances, though. 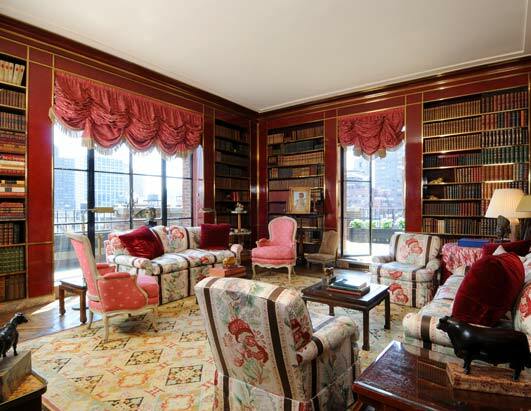 I’ve heard Albert Hadley (he of the famous oxblood lacquer library ; also note the coffee table in this peacock blue living room found via Mrs. Blandings ), and also uber-fancy decorator Vincent Fourcade , according to my boss, Miles Redd (tut tut). Guess it doesn’t matter all that much ‘cause it’s TRUE: A dash of red can bring more life to a room than a bushel of fresh flowers. Why? Like the “EXIT” sign guiding your way out of a smoky bar, bits of red cut through layers of traditional decorating or just as handily turn minimialist shrines on their noses. But the right shade of red is imperative. After recently painting my entire living room, walls and ceiling, in Fine Paints of Europe’s Tulip Red Hollandlac Brilliant (my perfect shade of Chinese red but the stuff costs a small fortune), I found that cheapo Rusto-leum’s Safety Red is the EXACT SAME COLOR. Or at least really, REALLY close. Of course it’s not marine-grade varnish like FPoE, but their oil-based enamel would make a great weekend project to tackle that Ikea Parsons table, child’s chair, or English-y desk . A less smelly alternative is a simple red lacquer box (pictured) to hold your remotes. Give your room long-lasting freshness with Big (or Little) Red!